…to make icecream, that is. Yes my friends, I’ve finally found it, a chocolate icecream recipe that doesn’t require any fancy specialized equipment to get that gloriously silky melt-in-the-mouth smooth texture that we icecream lovers crave. A chocolate icecream recipe that just requires a bit of mixing on the stove, then a bit of time for cooling and 8 or so hours of undisturbed freezing – almost too good to be true. When it comes to dessert, icecream is by far my favourite thing. Some people have a separate stomach for sweets, but my spare space is reserved solely for icecream. As a serious fan, I always used to be so disappointed when I would come across a recipe for a tasty looking icy confection in a recipe book or magazine. I’d skim to the end of the instructions just on the off chance, but invariably hopes were dashed by those aweful instructions: freeze in an icecream machine as per the manufacturer’s instructions. I had experimented with the tedious alternate method of freezing then pureeing in a food processor before returning the mix to the freezer to repeat again and again, but the results were never even close to the icecream perfection I was seeking. So one Christmas a few years ago I decided to splurge and invest in an icecream machine of my very own. Suddenly a whole world of possibility opened up in the dessert arena. Icecream, sherbert, gelato and sorbet you name it, I gave it a go. As a quick browse through the following list from the stonesoup archives will attest, Mr Icecream and I have churned out some magic together. But over the last year or so my icecream making workhorse has started to slow down. Sure his internal compressor still works like a charm, freezing just as it should, but unfortunately Mr Icecream has decided of late to stop churning when the mixture is only just starting to chill. As a result I’ve resorted to hand stirring while the icecream freezes away. And while it only takes 20minutes or so, Mr Icecream and I both know that it isn’t going to be a sustainable relationship. 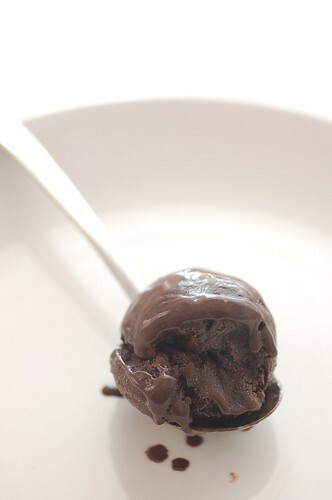 Which is how I happened to try the simple ‘leave it to freeze’ method on my latest icecream experiment. To be honest I was a little nervous that I’d end up with an icy mess but trust me gentle reader, this is one icecream recipe where those of you who don’t happen to be blessed with a friend like Mr Icecream, will be able to get the icecream of your dreamsâ€¦.. now I just need to work on a non-chocolate version – watch this space. Inspired by Skye Gyngell in her latest offering, My Favourite Ingredients. Apart from good quality chocolate, the secret ingredient in this icecream is the cocoa powder which has the double benefit of adding the rich dark flavour and providing solids which must do something to retard ice crystal formation and encourage the lush silky texture. If you do happen to be the proud owner of a working icecream machine,feel free to churn this mixture in it. My first attempt with this recipe was whipped up in my old icecream making friend with good results but I found my second attempt using the method below yielded as good, if not better texture, an opinion which was seconded by my favourite Irishman, a tough icecream critic himself. Whisk eggs, sugar, vanilla and salt together until pale. Place cream and milk in a saucepan and bring to a simmer. Remove from the heat, add chocolate and stir until melted. Pour hot cream mixture over the eggs, sift in cocoa powder and combine. Return to the saucepan and cook over a low heat for a few minutes, stirring continuously until the mixture has thickened slightly. Remove from the heat and strain into a clean container and allow to cool. Cover and freeze overnight or for at least 8 hours. Best if eaten over the next few days, if you have the discipline to let it last that long. I adore ice cream, and cannot WAIT to try the black pepper and cardamom. Unusual is divine. Yummmmm looks divine and no ice cream machine needed Thx!! What a coincidence! I was just sighing longingly over this recipe in the book this morning! Divine photograph, by the way! Ooh, lush! That looks decadently truffle-like. Made this on the weekend. It was excellent! Thanks! You’re speaking my language. I do have an ice cream freezer base in the freeze right now waiting for the next recipe that does it for me. Congratulations. This did it, and dark chocolate ice cream will be consumed shortly. Wow, wow, wow. Look at how dark that is! Heaven in a cup. beautiful site ! What is the measure “T” or “t”, please? “Teaspoon”? Thanks for the recipe. Don’t have lots of experience cooking and being from the US not used to metrics either… I can figure the measurements since I have the utensils to do that, but what is caster sugar? and what is the difference between alkalized cocoa powder and say herseys cocoa powder? I really want to try this recipe, but am stumped. Thanks… love your site and the photos are fantastic. looks great :) but how many grams is 300ml of double cream? This recipe is what made me a fan and instant follower of your blog! I’m an expat in Singapore and subscribe to the minimalist kitchen out of necessity, which means no ice cream maker. Plus, decent ice cream starts at $13 a pint!! 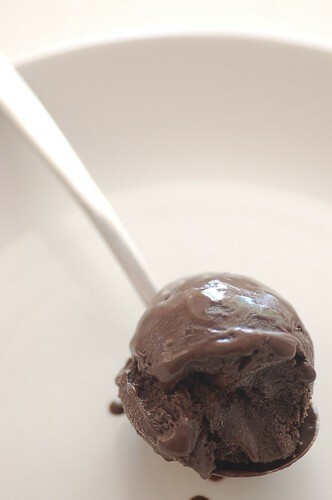 This is Rich Dark Chocolate Ice Cream is seriously the most awesome chocolate ice cream I’ve ever had/made/served! The last three visitors we’ve had were served a bowl of this incredible dessert and they couldn’t get enough. I do not have an ice cream maker, so I just let it stand for about 10 min before serving. I noticed this recipe was posted a while back…it’s definitely worth a repost!! Finding your blog helped me fall in love with my kitchen. Thanks so much! I have nestle baking cocoa. Is that alkalized? I went up to Woolworths and it was the only one they had. What would happen if I used non alkalized cocoa? Why did this show up on the “icecream” page as minimalist cooking? In other news: I’m making this. how many servings does this recipe make,considering i put them in a ramekin? this recipe dates back to my pre-minimalist cooking days.. enjoy!